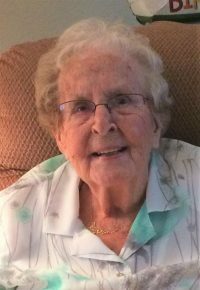 Rosemary Ann King – (91) – of 6652 Poinsettia Ave., St. Petersburg, FL, formerly of Hornell, died Wednesday morning (April 10, 2019) at her home, surrounded by her loving family. Born in Hornell on May 24, 1927, she was the daughter of Leo & Thelma (Young) King. While living in Hornell, she was a communicant of St. Ignatius Loyola Church. Rosemary grew up in Hornell and was a graduate of Hornell High School (class of 1947). She later graduated from Arnot Ogden Hospital School of Nursing (class of 1949), were she obtained her Registered Nurses License. Following her graduation from Nursing School, Rosemary returned to Hornell and was employed as a registered nurse at St. James Mercy Hospital, working her way up to the position of supervisor. While living in Hornell she also worked at Bath Veteran’s Hospital and served as a private duty nurse. After moving to Canandaigua in 1960, she was employed as a registered nurse at Gowanda State Hospital in Gowanda, NY. She later moved to Hamburg, NY where she resided for three years. While living in Hamburg, Rosemary continued to work at Gowanda State Hospital. In 1967, Rosemary moved to Collingswood, NJ where she was employed as an office nurse for Dr. Ira Weiner, a local Psychiatrist. In the summer of 1969, Rosemary and her family relocated to Florida, where she continued her nursing career at Bay Pines Veteran’s Hospital in St. Petersburg, FL. Before retiring in 1992, Rosemary was very proud that 30 years of her nursing career had been dedicated to caring for our nation’s veterans. For the past 25 years Rosemary had lived in St. Petersburg, FL, and was an avid bingo player. She loved spending time in the sunshine, either gardening or swimming in her pool. Throughout the years she loved traveling and making countless trips back and forth from Florida to Hornell visiting with her family. Affectionately known to her family as “The Laundry Lady,” it was commonplace for her to find clothes that were not properly put away and head to the laundry room with them. Never wasting time to check the pockets, Rosemary washed countless wallets, money, credit cards, driver’s licenses, photos and other important items, sometimes several times a day. No unguarded article of clothing was safe! In an effort to keep her mind sharp, Rosemary was an avid reader, reading over 2000 books, and working daily crossword puzzles. In spite of her age she embraced computer technology, enjoying computer games, reading on her Kindle, and keeping in touch with her children and grandchildren through email & Facebook. Without hesitation, Rosemary lovingly cared for her grandparents, parents, brother and sister in their final days. She considered it an honor and a privilege to serve her family in this manner — it was never a burden. In addition to her parents, she was preceded in death by her son, Robert, Jr.; her brother, Tommy King and her sister, Doris Kelleher. Surviving are 2 daughters, Luann (Lenny) Liss of St. Petersburg, FL and Patricia “Patty” (Jim) Dagon of Hornell; 4 sons, James (Lisa) Class of Seminole, FL, Martin “Marty” (Edith) Class of Seminole, FL, Thomas (Kelley) Class of Keller, TX and Dr. Steven (Dr. Michelle) Class of Terra Ceia, FL; 18 grandchildren; 21 great-grandchildren; several nieces & nephews. The family of Rosemary Ann King will receive friends on Friday (April 26, 2019) from 6:00 PM – 7:00 PM at the Dagon Funeral Home, 38 Church St., Hornell, NY . A Mass of Christian Burial will be celebrated on Saturday (April 27, 2019) at 11:00 AM at St. Ann’s Church with burial in St. Mary’s Cemetery. Rosemary’s family request that in lieu of flowers, memorial contributions in her name be made to St. Ann’s Academy, 41 Genesee St., Hornell, NY 14843. Sorry to hear of the passing of my aunt Rosemary. Condolences to the family. Oh the fond, loving memories of Aunt Rosie! As sad as I am upon hearing of her passing, I can’t imagine her joy when reunited with her beloved mom and dad, brother and sister. Aunt Rosemary was everything to us, her opinions mattered, her sense of humor made us smile and her generous spirit touched our hearts. The highlight of every Florida visit was to see and be with Aunt Rosie! On more than one occasion she made our trip possible by opening her home. She leaves such a beautiful legacy. May the care and love of family and friends provide peace and comfort. My most sincere condolences. Thinking of you and sending my love. sorry to hear about your Mom. My prayers are with your family. Your Mom and Aunt Doris looked quite a bit alike. Your Aunt Doris was a hoot to work with(the good old days).